RRB Group D 17 September Exam Admit Card Download: Direct Link Here – Finally, here is the day. 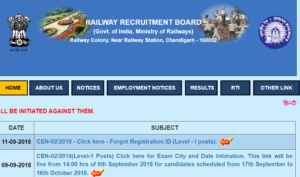 A Couple of days after activating the RRB Group D mock test links, and also activating the direct link to get RRB Group D forgotten registration number link, Board of Controller of Examination, Railway Recruitment Board of India has released Admit Cards online for 17th September 2018. Remember that “four days earlier” rule of RRB Admit Card release? That applied equally to both the posts i.e. Assistant Loco Pilot (ALP) and Group D as well. Thus, now it is confirmed that on 17th September 2018, written test, better known as Online Computer Based Test (or Online CBT) will be organised for 90 minutes duration. In that one and half hour applicants will have to answer 25 questions each of Mathematics, General Intelligence and Reasoning, General Science, General Awareness on Current Affairs etc. Undoubtedly, Admit Cards of Railway Recruitment Board, 17 September Test are now released and available for Thiruvananthapuram, Siliguri, Gorakhpur, Chennai, Chandigarh, Bilaspur, Bhubaneswar, Bhopal, Bangalore, Allahabad, Ajmer, Ahmedabad, Secunderabad, Ranchi, Patna, Muzaffarpur, Mumbai, Malda, Kolkata, Jammu and Guwahati.